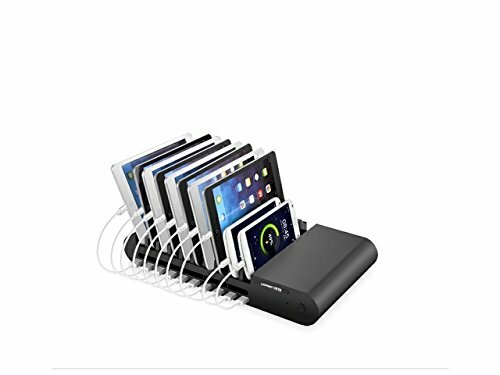 10 port Universal USB charging station mobile tablet with multi-port switch bracket Digital Charger ,ideal for Companies, shops, cafes, and other public places Input: AC 100-240V 50/60Hz,Max 2A Output: 8 ports x 2.1A, 2 ports x 1A Support charge and store up to 10 digital devices simultaneously 5V/1A ports are compliant with the majority of cell phones such as Apple, Samsung, Blackberry, HTC, Microsoft, Huawei, Nokia, Kindle, Sony Ericsson, Nexus, etc. 5V/2.1A ports are compliant with the majority of tablets such as Apple, Samsung, Lenovo etc. 5V/1A ports are compliant with the majority of cell phones such as Apple, Samsung, Blackberry, HTC, Microsoft, Huawei, Nokia, Kindle, Sony Ericsson, Nexus, etc.